Although, or perhaps because, most of us write less and less by hand, our fascination for handwritten letterforms is growing. Typeface designers who specialize in traditional, charming, or spectacular lettering with a handmade look have become role models for today’s young typographers and graphic design students. Script fonts―digital type families based on handwriting―are among the most sought on the typography market today. Scripts from the past, be it 18th-century formal calligraphy or advertising headlines from the 1960s, are being digitized and turned into OpenType programming. The love of the hand-written look is nothing new. Even the oldest printed books pretended to be something unique and not a machine-made mass product. Hand to Type is a collection of some of the best work by today’s lettering artists in the fields of hand-made and digital script forms. The book includes texts about outstanding designers and contains a series of expert chapters outlining the principles of script forms that may be lesser known to most western typographers―from the German Sütterlin to Arabic and Asian scripts. 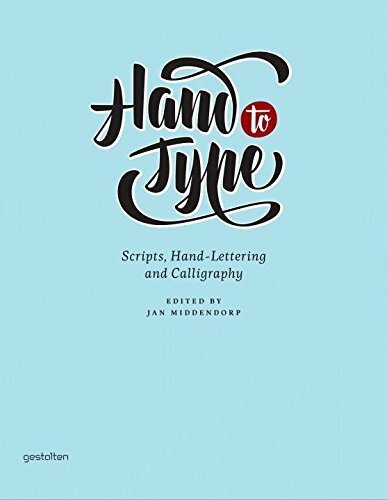 Hand to Type also traces script fonts back to some of the earliest examples: hand-lettering as a sign of authenticity, or printing type made to look like formal writing. If you have any questions about this product by Brand: Gestalten, contact us by completing and submitting the form below. If you are looking for a specif part number, please include it with your message.